Featured at this year's conference will be Lifeclinic's "Synergy", a comprehensive program that blends state-of-the-art hardware, software and value-added services, all designed to increase retail profits by building consumer loyalty and enhancing current and future revenue streams. Lifeclinic International, Inc., the world's leading manufacturer and distributor of automated health testing kiosks, will be showcasing its latest consumer healthcare technology at the National Association of Chain Drug Stores (NACDS) Pharmacy & Technology Conference, booth #1099, August 12-14, 2007, in Boston, Massachusetts. At the foundation of the Synergy program is the most advanced automated health testing kiosk available today: the LC600. This pharmacy-friendly health station offers automated blood pressure, weight, body fat and blood oxygen tests. The health station's scalability allows for the integration of additional tests, such as those for sight, hearing and bone density, from multiple manufacturers. Peripheral input ports include IR, USB and Bluetooth for interfacing and uploading data from various personal health devices such as glucose meters and pedometers. Consumers can easily navigate through the LC600's interface of test options, health information, and a database of the retailer's products, coupons and discounts, via a 15" color LCD touch screen. Optional features include both a magnetic stripe and barcode reader for retail loyalty card programs. The barcode reader can also generate multimedia product information, allowing consumers to retrieve tailored product information for general merchandise, HBA, OTC and Rx products. Pharmacies wanting to enhance their Medication Therapy Management program or other pharmacist/patient consulting services, can take advantage of the LC600's Internet readiness for secure, HIPAA-compliant, open-source integration into most pharmacy network applications for real-time collection and management of biometric data. The health station's telephone handset gives consumers a direct connection to the pharmacist or pharmacy-directed healthcare provider. Consumers can also manage their own data from any Web browser via Lifeclinic.com or the retailer's Web site. In describing the Synergy program, Lifeclinic's Senior Vice President, Mike Cavotta said, "We've established valuable relationships with consumers who have regularly used Lifeclinic blood pressure monitors to help them manage their blood pressure. Now, with the LC600's wider array of biometric tests, we can enhance their testing experience and at the same time educate them about the retailer's products and services via 3M's Digital Signage technology. It's a win-win situation for both consumers and retailers." 3M Digital Signage software enables Lifeclinic and its media production partners to schedule, distribute and play media-file playlists at multiple, identified store locations. The end result is delivery of a unified, targeted marketing message to the consumer at the point-of-interest and purchase. Besides Synergy's end-to-end solution for personal health monitoring and retail marketing, it's also designed to help retailers and companies motivate people to become more actively involved in their health care. "Self-monitoring and self-education are crucial steps towards becoming healthier; however, the most important thing is to do what is necessary to become and stay healthy," said Lifeclinic's Senior Vice President, David Read. To demonstrate the effectiveness of a Synergy-based incentive program, Lifeclinic will feature the "Walk the Walk" contest. Top chain pharmacy executives who received Sportbrain pedometers prior to the conference can get started by registering at Lifeclinic's booth #1099. As participants walk around the conference area their steps will be recorded via a small pedometer that can be clipped to a pocket, belt or waistband. Data from the pedometer can later be uploaded at a Lifeclinic health station at the booth. Participants who record the most steps will win an iPhone or iPod. Read continued, "We want to show the value of moderate exercise through regular daily activities, its positive impact on individual health and how incentives can maximize participation." Lifeclinic was established in 1976 as Vita-Stat Medical Services, Inc. Since then, it has grown to be the world's largest supplier of commercial, automated, health kiosks. Lifeclinic health kiosks can be found in over 30,000 pharmacies and 4,000 company and organizational wellness centers worldwide, accounting for 500 million blood pressure measurements annually. Lifeclinic health kiosk and management systems encourage individuals to take an active role in their health care and provide corporate management with the tools to help reduce costs while simultaneously improving the health of individual employees. 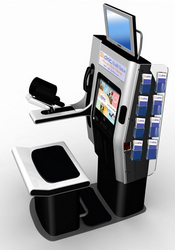 Lifeclinic health kiosks can be found throughout the United States and many other countries worldwide. About 3M Digital Signage Inc.
3M Digital Signage is a full-service provider of active and interactive digital solutions for retail, financial services, entertainment, corporate communications, and other industries. The company's products and services have powered thousands of digital signage locations worldwide. The company is headquartered on Bainbridge Island, near Seattle, WA.